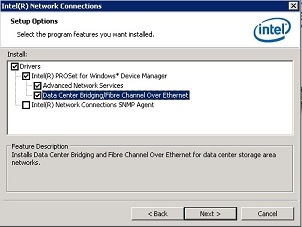 Frequently asked questions about Data Center Bridging (DCB) and Fibre Channel over Ethernet (FCoE) support on Intel® Ethernet Adapters. VMware* VSphere 5.1 adds support for SR-IOV. Intel® Ethernet Converged Network adapters support both Fibre Channel over Ethernet (FCoE) and SR-IOV. However, FCoE and SR-IOV cannot be configured simultaneously on the same physical port in VMware’s implementation of SR-IOV for Intel® Ethernet Adapters. Which Intel® Ethernet converged network adapters support Intel® Ethernet DCB Service for FCoE? What software do I need for Intel® Ethernet DCB Service for FCoE? Intel® Network Connections software versions 15.4 and later contain DCB and FCoE support. Intel® Ethernet DCB Service for FCoE is incompatible with Microsoft Server 2012 NIC Teaming, also known as Load Balancing/Failover (LBFO). Do not create an LBFO team using Intel® Ethernet 10 gigabit ports when Intel® Ethernet DCB Service for FCoE is installed. Do not install Intel® Ethernet DCB Service for FCoE if Intel Ethernet 10 gigabit ports are part of an LBFO team. Install failures and persistent link loss may occur if Intel® Ethernet DCB Service for FCoE and LBFO are used on the same port. See Windows* Server Hotfixes Required for MPIO & DSM for required hotfixes. Microsoft Hyper-V* Server and Hyper-V* roles are supported in Intel® Network Connections version 15.8.1 and later. Data Center Bridging (DCB) and Virtual Machine Queues (VMQ) are not compatible. If you enable both DCB and VMQ communications over the network port will fail. Intel plans to support VMQ with DCB in a future software release. What certifications and hardware compatibility are available? Certified Intel® Ethernet DCB and FCoE Drivers lists compatible targets and switches. How do I install the DCB and FCoE software in Windows*? Note DCB/FCoE feature selection is only available when an Intel® Ethernet Adapter supporting the feature is installed. How do I configure DCB and FCoE? Fibre Channel over Ethernet (FCoE)/Data Center Bridging User Guide provides details. Must I configure my adapter for jumbo frames if I am using FCoE? No. When you install DCB/FCoE, 2.5K mini-jumbo frames are supported for the FCoE traffic independent of the adapter configuration. Therefore, you can configure your adapter to enable or disable jumbo frames for LAN traffic without having any effect on the frame size used for FCoE. How do I configure my server to boot over an FCoE connection? How do I configure my switch for FCoE? Refer to your manufacturer's documentation for switch configuration and optimization. User Guides for Intel® Ethernet Adapters includes configuration examples for the Cisco Nexus* 5000 and the Brocade 8000. Look in the Intel fibre channel over Ethernet (FCoE)/Data Center Bridging (DCB) Guide.